Products Powered with NVIDIA© CUDATM, 6X faster. EaseFab products take advantage of the latest NVIDIA® CUDA™ technology of shifting video "central processing" load from your computer CPU to "co-processing" mode on NVIDIA's CPU and GPU instead. CUDA, as NVIDIA's parallel computing architecture, enables dramatic increases in computing performance by harnessing the power of its own GPU and therefore, reserves more spaces and resources of your computer CPU that can be used for other applications and tasks. EaseFab cooperates with this new acceleration technology flawlessly by auto detecting the CUDA-enabled GPU and accelerating the video conversion with 6X faster speed. The video conversions that leverage CUDA technology will be indicated by a vivid glowing CUDA logo and only take minutes rather than hours to accomplish. With NVIDIA® CUDATM technology, the video conversion is processing on NVIDIA's GPU instead of your computer's CPU, so more CPU resources is available for other applications. Now for your faster and better video conversion experience, EaseFab products are optimized with NVIDIA® CUDATM technology. It means 6X faster HD and SD video conversion, higher quality, and smoother playback for all videos. CUDA technology saves you time, and enable GPU encoding/decoding acceleration to improve the performance, once CUDA-enable graphics card is detected. Now, you can instantly see which conversion formats leverage CUDA technology. 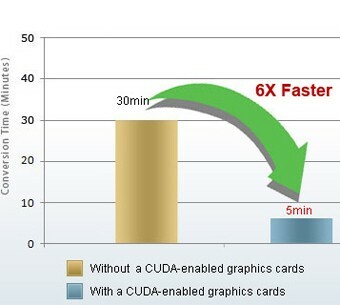 The right chart shows the performance while converting videos with and without CUDA by EaseFab products. Video Converter Ultimate The ultimate tool to convert video/audio, rip and backup DVD and Blu-ray movies in one place. Video Converter Easily convert all video files from one format to another in state-of-the-art quality. DVD Ripper Rip DVD movies to MP4, AVI, WMV, MOV, MP3, WMA and more for play anywhere you like..
LosslessCopy An efficient, safe, fast and ease-to-use tool to backup, rip and copy Blu-ray/DVD movies to MKV/MP4/MOV with multiple audio tracks & subtitles. MP4, AVI(XviD), ASF, WMV (Windows Media Video), MPG, MPEG1, MPEG2, FLV (Flash Video), 3GP, 3GPP, MOV(QuickTime), MKV, TS (MPEG-2), M4V(without DRM), VOB, TP, TRP, NSV, RM, RMVB, 3G2, NUT, DV etc.